Many vehicles promise Melville families that they can easily provide drivers and their passengers with the space that they need, but few actually deliver. With the 2017 Dodge Grand Caravan, that never has to be a worry due to the over 81 space configurations provided by this seven-passenger vehicle. Indian Head drivers want to ensure that their families are able to have the true ease of access and versatility that they need. With over 80 unique ways to configure the vehicle to fit their specific needs the 2017 Dodge Caravan is the minivan they’ve been looking for. Check out just a couple of the ways that the Dodge Caravan can help you make space below. Cargo Carrier – Minivans aren’t just for hauling around passengers, sometimes you need that extra space to get large, awkward fitting loads of cargo, like hockey or lacrosse gear, to your destination. 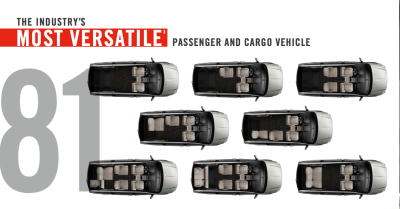 With over 4,072 litres of cargo space behind the front seat when all rear seats are in the floor, you’ll always have the cargo carrying space you need. Stow ‘N Go – Sometimes you’re not just carrying cargo or passengers, many times you need to do both. With the Dodge Grand Caravan this is simple. For an equal balance of passenger and cargo space simply fold down the third row of seats for 934 litres of cargo space and room for four passengers. All or Nothing – Car packed full of passengers with personal belongings of their own? No problem! The 2017 Grand Caravan comes with in-floor storage in the second row and trunk, overhead storage bins, storage cubbies, dual gloveboxes, and a Super Console with hidden storage. We’ve only managed to cover four of the different ways in which you can make the 2017 Grand Caravan work for you. To discover just a few more of the ways that the Grand Caravan can make cargo space magic visit Knight Weyburn Chrysler Dodge Jeep Ram today at 1627 First Avenue N.E. in Weyburn. For any questions, concerns, or to schedule a test drive in advance, we can also be reached by phone at 1-888-901-0983.